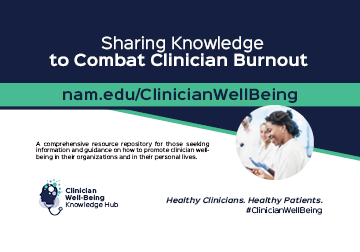 This toolkit is packed with useful information and resources so you and your organization can widely share the Clinician Well-Being Knowledge Hub. This toolkit includes social media posts, an email template, printable materials, logos, and more. All of the resources are free to download. These resources can be used on your website, in your newsletters, at conferences/meetings, and across your social media. Scroll below and explore and join our mailing list for the latest updates. 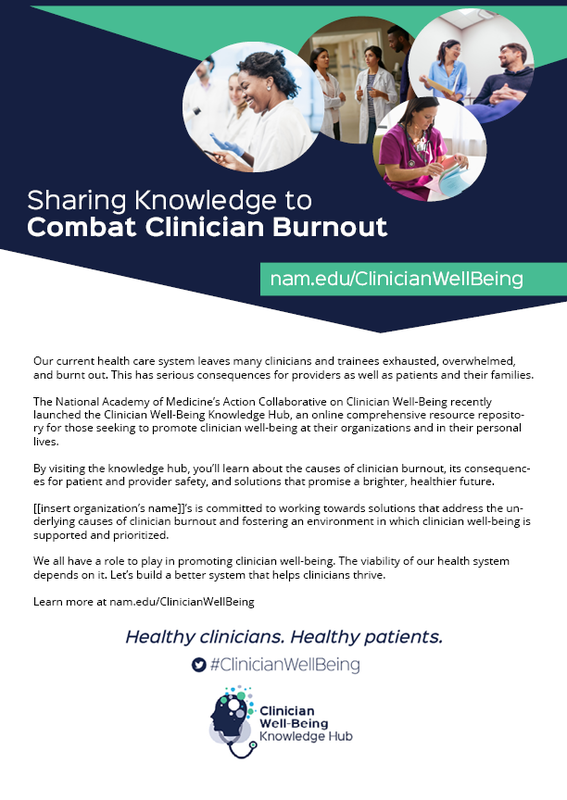 The National Academy of Medicine’s Action Collaborative on Clinician Well-Being and Resilience recently launched the Clinician Well-Being Knowledge Hub, a first-of-its-kind comprehensive resource repository to help organizations learn more about clinician burnout and the solutions that promise a brighter, healthier future. 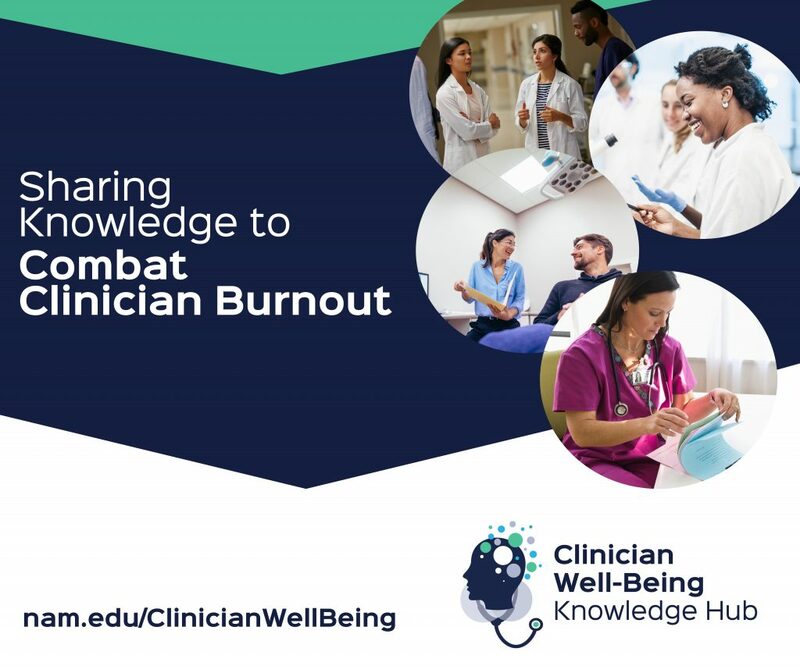 The knowledge hub includes research articles, news articles, blog posts, toolkits, reports, and briefs that provide further insight into the causes of clinician burnout; its consequences for health care professionals, patients, and their families; and innovative approaches that organizations can take to promote well-being. 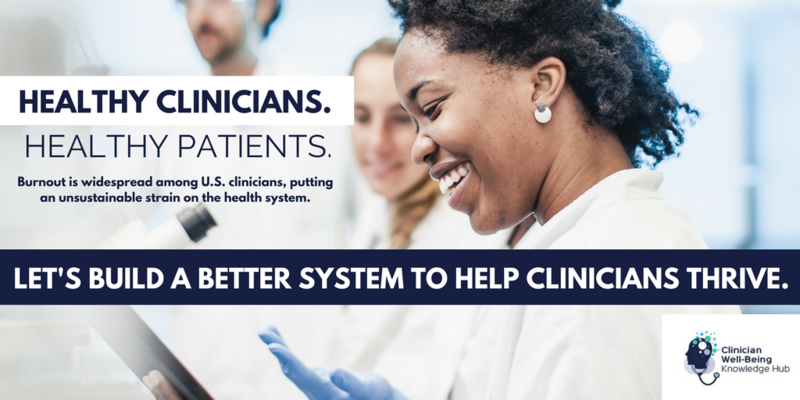 Healthy clinicians provide better patient care. 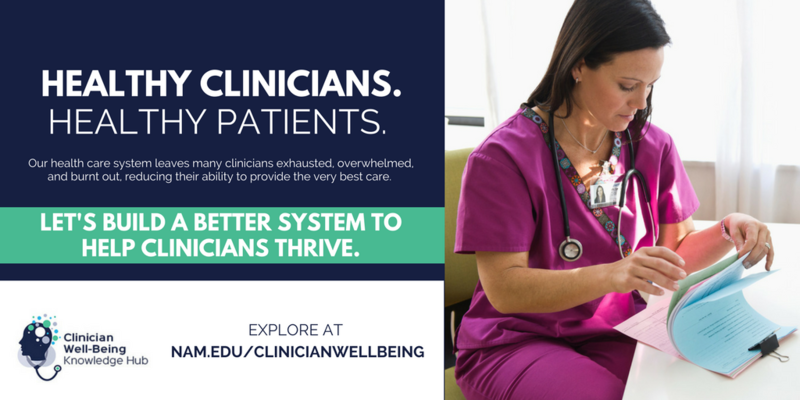 Let’s build a system that helps clinicians thrive. 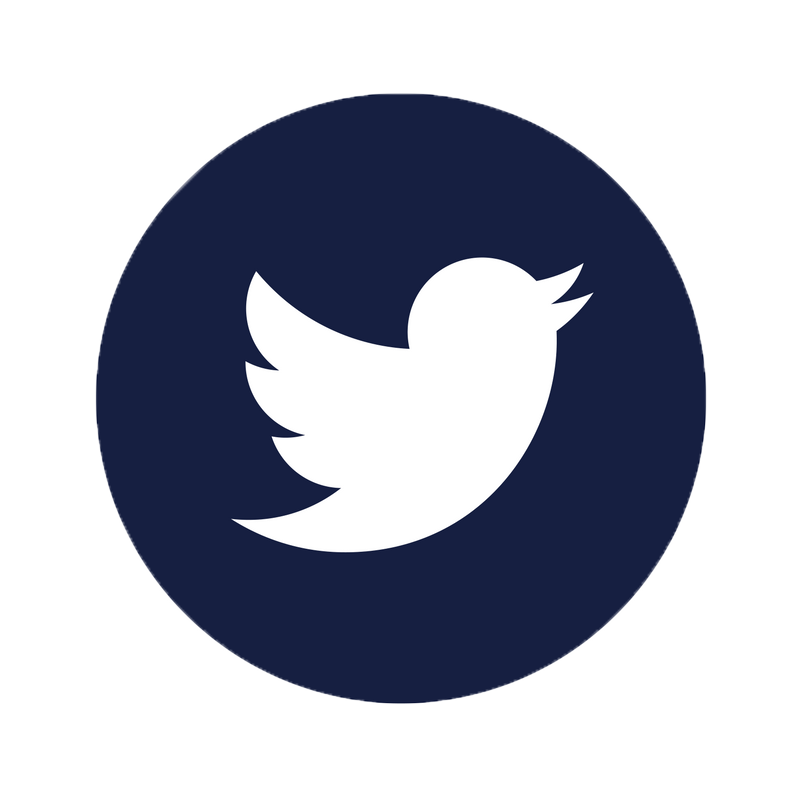 The following social media tools have been developed to help individuals and organizations easily share the Clinician Well-Being Knowledge Hub. All resources below are free to download and use. Browse all of the images at once by scrolling through the gallery at the bottom of this page. The following newsletter text can be adapted and customized by your organization to help spread the word! Download the Word document below to copy & paste the text. This Microsoft Office OFT email allows you to send a professionally designed email directly from your inbox to whoever you think might benefit from the resources in the knowledge hub. We’ve included messaging you can use, or you can personalize the email to make it your own. 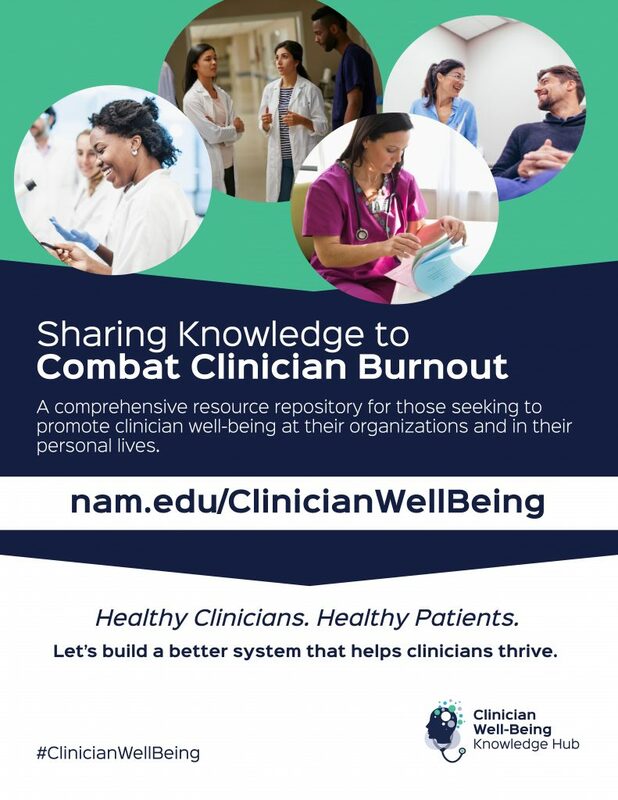 The National Academy of Medicine has created four standard ad sizes to use on your organization’s website and social media platforms to promote the Clinician Well-Being Knowledge Hub. Download the ads below. The following materials have been developed to print and distribute throughout your organization. They may be helpful for staff, membership, and/or conferences. The flyer below can be customized with your own logo! Browse all of the print materials at once by scrolling through the gallery at the bottom of this page. Perfect to display throughout your facility! 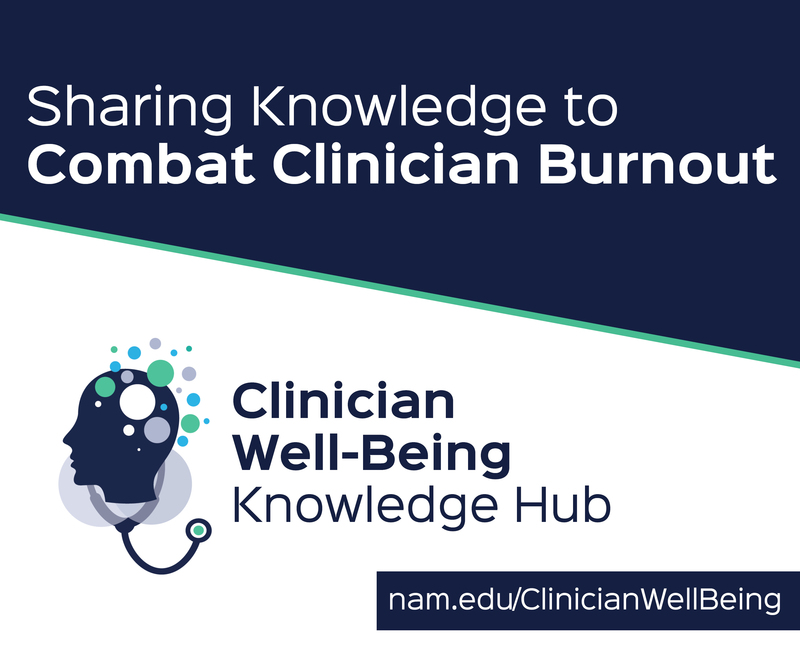 The Clinician Well-Being Knowledge Hub logo was developed by the National Academy of Medicine to help organizations share the knowledge hub with their stakeholders. 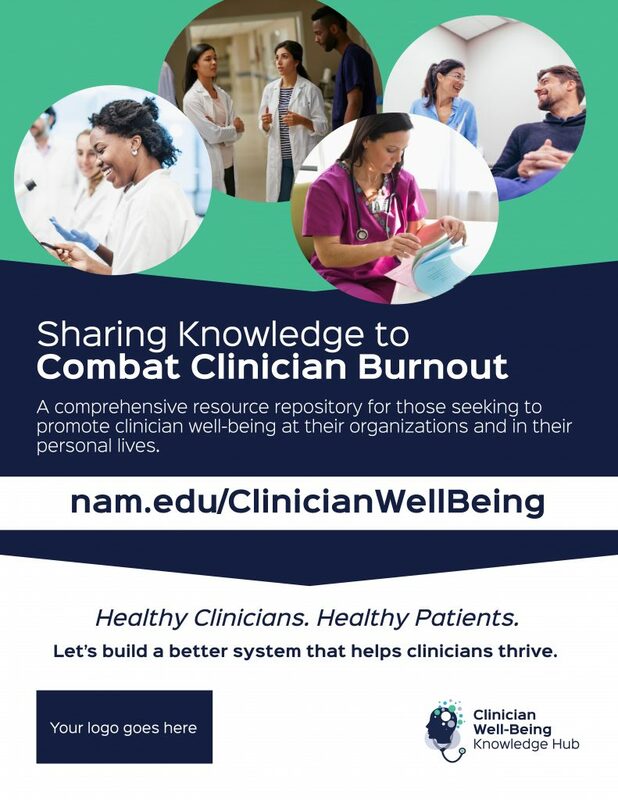 Logo usage: The National Academy of Medicine allows organizations to use its Clinician Well-Being Knowledge Hub logo in order to help share the knowledge hub and its related resources only. To maintain brand integrity, please use the provided logo files only. The logo may never be altered in any way or used for the production of gift items. Questions about the knowledge hub? Please email Kyra Cappelucci at KCappelucci@nas.edu. Browse all of the images by clicking through the gallery below.